The First U.S. 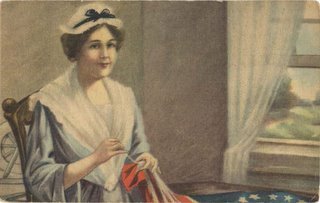 Flag and Seal, Mrs. Betsy Ross the Author. 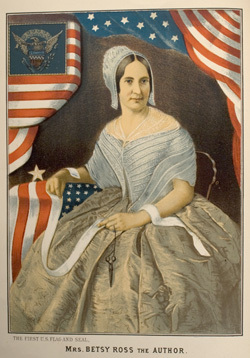 This was the frontispiece from an 1878 book, with an extremely elaborate title: The History of the First United States Flag, and the Patriotism of Betsy Ross, The Immortal Heroine That Originated The First Flag of the Union - written by Col. J. Franklin Reigart, owned by the American Antiquarian Society.